Looking for a pool cover for your inground or above ground pool? If this is the first time you’ve shopped for a pool cover online, the first thing you’ll probably notice is the huge range of brands, materials and models there are – and how similar they all seem. Pool covers come in all kinds of styles from mesh to bubble wrap, and they’re manufactured using a wide range of materials from vinyl to polyethylene to polypropylene. There are different types of pool covers, too, depending on the job you want them to do. Common types include security covers, winter covers, thermal blankets, solar covers and automatic covers. Prices are all over the board, too – from less than $100 to more than $1,000. So, how do you decide which one to get? This buying guide will make your shopping easy. We’ve reviewed dozens of the best-selling, best-rated solar pool covers sold on sites like Amazon and Walmart.com and picked the single best choice for each common homeowner’s need. Whether you need a mesh safety cover to keep your family safe, a winter cover to keep away debris and algae or a solar cover to keep your pool warm through the night, we’ll tell you which one to buy and why. So, let’s cover it now! The first half of this page lists our top picks for the best pool covers for above ground pools and in-ground pools. You can see how these pool covers compare in the table below. After the comparison table, we review each of these pool covers in more detail to give you an idea of its pros, cons and installation requirements. Then, we explain the factors we consider when evaluating pool covers. Finally, we explain the different types of pool covers and provide a list of the most trusted brands. Swimming pools are really good at absorbing heat when it’s sunny. That’s because water absorbs as much as 75 to 85 percent of the solar energy reaching its surface. Evaporation is responsible for taking away most of this absorbed heat. Leaving your pool uncovered at night, when there is much less solar energy available, rapidly chills your water. 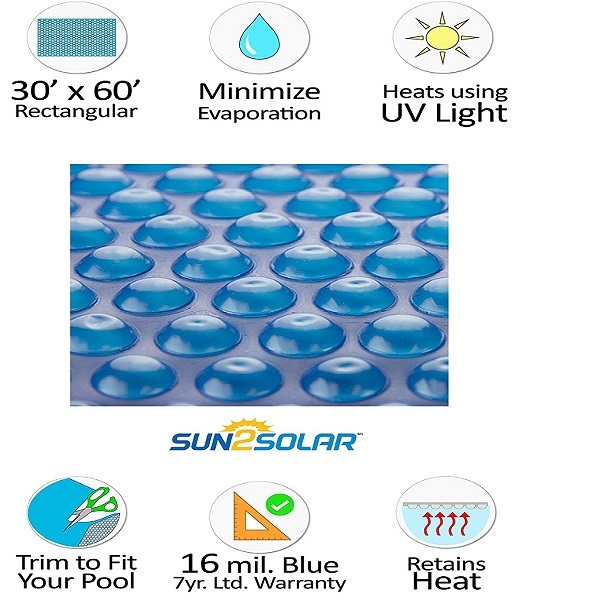 Like all other solar pool covers, Sun2Solar’s Blue Oval pool cover is designed to reduce evaporation by 95%, ensuring your pool retains its latent heat when not in use. The Blue Oval comes in a tranquil blue color made from high-UV-treated resin that is guaranteed to last through several seasons. This guarantee is supported by Sun2Solar’s seven-year warranty, which includes two years of full warranty. The surface of the Sun2Solar cover consists of thousands of tiny bubbles that capture solar heat and retain it in the water. Installing this cover is easy. You don’t need a professional. If you have a rectangular pool, it will be easier since the cover itself is rectangular. But it’s not difficult at all to fit this cover to other pool shapes. Just use a pair of scissors to trim the cover to shape. And don’t worry about voiding the warranty. You’ll be covered after cutting it to size. The Sun2Solar Blue Oval pool cover can be used for both above ground and in-ground swimming pools. This cover comes in many different sizes, ranging from 4′ x 8′ to 30′ x 60′. A winter pool cover protects your pool from elements and debris during the several months when it will not be in use. Leaving your pool uncovered through the winter ends up creating a lot of work in cleaning and maintenance. You have to remove months’ worth of leaves and debris. If not, the the junk will overwork your pool’s filter and pump system (which means more energy used) and it will cost you to buy more chemicals to kill any algae growth. This time-tested Blue Wave winter cover is made from a hardy and extremely durable woven polyethylene. It can easily handle leaves, dust, rain and snow. First, choose the right size. There are 11 size options, ranging between 12 by 20 feet to 30 by 60 feet. Each cover size includes a 5-foot overlap, so, a 30 by 60 feet cover is actually 35 by 65 feet. For an in-ground pool, expect to spend at least $300 and often more than $400 on a good quality cover. But if you own an above ground swimming pool, there are cheaper options available for around $200 or less. The Blue Wave Oval solar blanket is not the best above ground pool cover, but it is one of the cheapest. Prices start at around $50 for the smallest size (12 by 24 feet) and run up to about $250 for the largest (21 by 41 feet). At a 12 mil thickness, this cover is noticeably lighter than more expensive pool covers of the same bubble-wrap design. On the upside, you (or your kids) will find it a cinch to unpack and roll this cover onto the pool – and to remove it. Despite its lightweight design, you can expect this cover to last for at least 3-5 years. The 5-year warranty should give you some confidence about the cover’s durability. This solar cover is clear, unlike the opaque ones that are more common. The advantage of a clear solar blanket is that it allows more heat to reach your pool during the day. It can raise the water’s temperature by up to 15 degrees. If you are looking for a heavy duty winterized pool cover for your above ground pool, get this one. The Arctic Armor is built to protect your pool from the worst of winter – be it rain, snow, sunlight, fallen debris or biting cold. This pool cover comes in three color options; blue, green and black. All are opaque. This is beneficial for all those cold months when your pool will be sitting dormant. Without the cover, the still water would make a perfect breeding ground for algae. Thankfully, the opaque cover ensures that not no sunlight reaches the pool. This Arctic Armor cover is made from durable woven polyethylene fibers. This material is durable enough that the manufacturer can offer a 15-year warranty. If you have been buying a new, cheap pool cover every time winter rolls around, this is the one you should buy. It will last through many seasons without showing much wear and tear. The pool cover is made for 33-ft round above ground pools. The cover itself is 37 feet in diameter. The extra 4 feet allows you to wrap the cover around the edges of the pool for a more secure installation. For even tighter security, a vinyl cable encircles the cover’s circumference, using several metal grommets to hold the cover tightly in all weather conditions. Thermal covers and solar covers are mostly the same thing: they both heat the pool and retain heat. But they are not exactly the same in one key aspect: a solar cover heats a pool faster than a thermal cover, because it is clear which allows the sun to shine through. A thermal cover, on the other hand, is designed specifically for retaining heat. Most thermal covers also allow solar energy to get into your pool heating, though not nearly as much as solar covers. If you are more interested in a cover that will retain heat at night and during cold days, then look for an opaque thermal cover that is thicker and hence better at preventing evaporation than a thin solar cover. For example, this Sun2Solar blue pool cover is 12 mils thick which makes it efficient at trapping heat in the swimming pool. 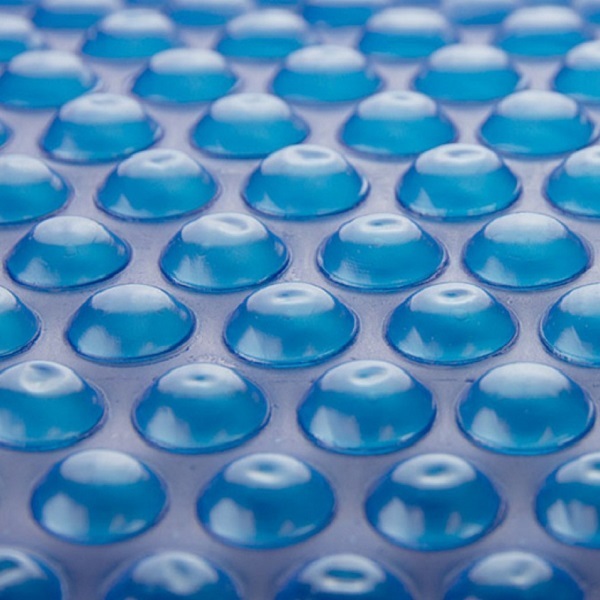 On the underside of the cover, thousands of tiny bubbles serve two functions. One, they trap solar energy and use it to heat the water in contact with them. The second function of the bubbles is to act as an insulator. The air trapped in these bubbles work effectively to prevent heat loss at night and when it’s cold. The Sun2Solar is oval but you can trim it to fit any pool shape. It comes in several sizes ranging from 10 by 15 feet to 21 by 41 feet. You can use this thermal cover on an above ground or in-ground pool. The cover comes with a six-year warranty, with two years having a full warranty. Note that this cover is not meant for prolonged use. Do not use it for months in the winter to keep your pool warm. It will be ineffective and will deteriorate very quickly. Use a winter cover instead. Swimming pools are fun and relaxing, but they are also dangerous and potentially fatal to children and pets. Even at your most vigilant, you cannot keep your kids in your sight all the time – it’s easy for them to play too close to the pool or even get inside without your knowledge. One of the best safety pool covers is this one by Arctic Armor. It is designed for in-ground pools measuring 20 by 40 feet. The cover is 22 by 42 feet to provide a secure installation. The Arctic Armor mesh cover is not just for safety; you can also use it as a winter cover. The mesh permits rainwater to pass through but filters out leaves and other debris. It is covered by a 12-year warranty. If a pool cover costs $100, we expect it to be small, thin and with limited use. But if a pool cover goes for $600, we’ll expect a lot from it. It should be highly durable, effective at what it does and easy to use. The better the balance between value and price the higher we’ll rate a pool cover. Often, companies will tout their 7, 10 and 15-year warranties to lure customers. You’ll even find a cheap solar cover with a 7-year warranty. So the first thing we check is the length of the full warranty. It should be at least 2 two years. Limited warranty should then extend to at least five years for cheaper pool covers and at least 7-10 years for heavy duty covers. For details on the different types of covers, there are, see the ‘Types of Pool Covers’ section below. Also, don’t forget to check the cover size. Many manufacturers provide different sizes to fit various types of pools. The importance of buying the right cover for your type of pool is that installation methods are different. Unlike an in-ground swimming pool, an above ground pool doesn’t have a deck where you can drill in metal anchors to hold the cover in place. It will require a different installation method. Durability depends mostly on the material used in the cover and the quality of construction. Thin, lightweight solar covers last between 1 and three seasons while thicker ones can last up to 5 seasons. We rate poorly those covers where many customers complained that material started disintegrating within a few weeks. But we also recognize that many homeowners want a pool cover that will not make their backyard look ghastly. So we put a bit more weight on nice-looking pool covers. We especially love it when a manufacturer provides several color/design options. + How Is It Secured? For above ground pools, grommets and vinyl ropes are often used to anchor the cover in place. Ease of installation and removal is especially important for solar and thermal covers that you have to put in the pool and remove frequently. The cover should be easy to secure and light enough that you can roll it up easily and quickly. What we look for in a material is durability (2-15 years depending on the type of cover), construction quality (stitching, seams, etc.) and effectiveness (e.g., how well it keeps out debris or how well it retains heat). Pool covers are designed to withstand the damaging effects of UV rays, for a certain period. Depending on the material used and level of UV protection, a pool cover can last anywhere between 1 season and ten seasons. Most pool covers don’t have a specific UV rating that you can use to compare them. But features like thickness, type of material and warranty can give you an idea of how long the cover can resist UV damage. Many solar and thermal covers have a film of bubbles on their underside that acts as insulation to prevent heat loss. Other solar covers may use special materials to keep the water warm even in the coldest months. Customer feedback is extremely important when ranking pool covers. We check the best that customers have to say as well as the worst. While a few average and negative reviews are normal, a deluge of negative reviews and ratings raise a red flag. We look for pool covers with mostly positive customer feedback. Why Buy a Pool Cover For Your Home? Your pool loses most of its heat through evaporation. This is not a big issue on a sunny day, since water is still absorbing heat from the sun. But at night or when the weather is cloudy, pool temperature drops quickly. A solar pool cover does two things to slow the loss of heat in your pool during those times. During the day, it warms your pool by allowing solar energy to heat the water. When there is no sunshine, the cover prevents evaporation of water, thus retaining warmth in the pool. Using the right pool cover, you no longer have to use a pool heater when you want to swim in the evening or on a cold day. You can even keep the pool open in the early weeks of winter and open it earlier before the hot weather has fully emerged. Pool cleaning is not only tedious; it is expensive. Running your pool pump and filter system frequently uses a lot of energy. A pool cover can reduce the need to clean the pool often, especially when it’s not in use. In winter, a pool cover also prevents debris, leaves, and twigs from getting into the water. Opaque (not mesh) winter covers also prevent algae growth. If it’s not winter, you can just get a leaf net to prevent twigs, leaves, and wind-blown debris from getting into the water. Between 2005 and 2014, more than 500 children in the US aged less than 14 years died in the accidental drowning. Most of these accidents involved home swimming pools.No matter how vigilant you are, you can’t always protect your kids from the dangers of an open pool. And it’s not just your kids but also animals in the homestead. Buy a safety pool cover to protect your children and pets. You can buy an automatic one that closes at the press of a button or go for a cheaper one that you set up and remove manually. A pool cover saves you money in several ways. Less energy usage. You don’t use your pool pump or pool heater as often. Fewer chemicals. With a cleaner pool and reduced evaporation, you use fewer chemicals to keep the pool clean and healthy. With a winter cover, you can go the entire season without using chemicals. Protects your pool against damage, especially during winter. Your pool pump and filter will last longer. You can get reduced rates from your home insurer by making your home safer. If you didn’t find the cover you were looking for in our reviews above, we have a few other recommendations. For a combined winter and safety pool cover, try the CES Rectangle Inground Mesh Safety Pool Cover. It measures 16 by 32 feet and includes 4’ by 8’ center end steps. The mesh keeps debris out and protects your kids and pets from accidental drowning. But it allows rain and some light through. If it rains too heavily, you’ll have to drain some of the water from the pool. You may also have to treat the pool frequently during winter to prevent algae growth. 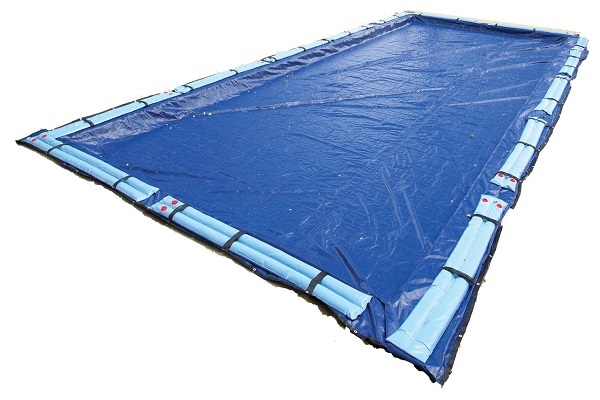 Another good safety pool cover is the Blue Wave 20ft x 40ft Rectangular In-Ground Pool Safety Cover. There are five size options. It comes with brass anchors for drilling into the deck and stainless steel hardware that resists corrosion. Reinforced seams and underside prevents abrasion and improves durability. You can also use it as winter cover though it will not protect against algae. Another great safety pool cover is the Water Warden Safety Pool Cover for 18 x 36 feet In-Ground Pools. 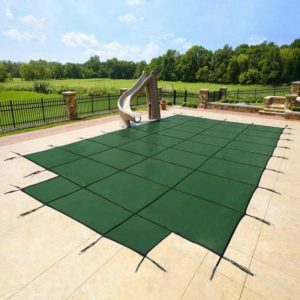 This green mesh cover comes in almost three dozen sizes, allowing you to choose the best fit for your pool. All the hardware you want to install it will be included. Even though it’s mesh, this cover blocks most of the sunlight from reaching the water. So you can also use it as a winter cover without worrying about excessive algae growth. 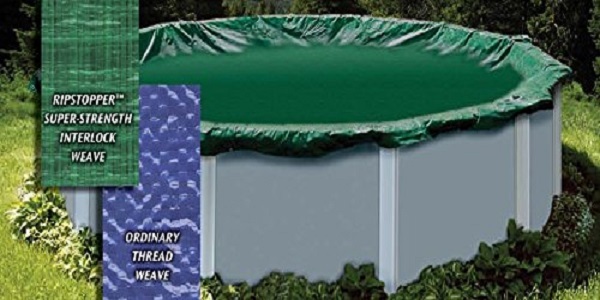 If you prefer a green pool cover, check out the Yard Guard 18 x 36 feet Pool Safety Cover. The tight mesh keeps your kids and pets safe and prevents debris from entering the pool. For a premium safety cover, I recommend the Loop-Loc Ultra-Loc II Solid Safety Pool Cover with Mesh Drain Panels. It costs a whopping $1,500 but you get plenty for your money. The manufacturer claims that it is strong enough to support an elephant. Furthermore, the cover uses a super strong polyester thread for weaving and double perimeter webbing for full strength. This is the strongest safety cover you can buy online. It comes with a 15-year warranty. If you are looking for a solar or thermal cover, the Sun2Solar Clear 22 by 44 Foot Rectangle Swimming Pool Solar Heating Blanket is a great choice. The extra thick (16mil) material is really good at retaining heat in the water. It also includes a layer of bubbles that warm up the water and also act as insulation to prevent heat loss. The clear material allows more solar energy to pass through. It warms water better than colored solar covers. WARM WATER / RETAIN HEAT? Click on a Pool Cover Type to learn more. These are used to protect the pool from debris during winter. They may also act as safety covers to protect kids and animals from drowning. These are reinforced mesh pool covers designed to protect animals and children from falling into the pool. A mesh type of cover though not as strong as a safety cover. Designed to allow water through but capture leaves, twigs and other debris. This is a cover that allows nothing, not even light, into the pool. It’s ideal as a winter cover because it prevents algae growth. Some solid pool covers are also safety covers. Solid pool covers have to be drained regularly when water collects on their surface. A non-solid cover with spaces for water to run through but not leaves and large debris. Can be used as a safety or winter cover. These are covers that combine both solid and mesh materials. They are designed to offer greater protection against debris and algae while still allowing rain and snow to run into the pool. So there is no need to pump water from the cover. Pool covers that can be activated or retracted by pressing a button. They are more expensive and require a pro to install. Extra-thick pool covers that insulate the pool from evaporation and heat loss. Pool covers designed for use with above ground pools only. They usually come in round or oval shapes. Pool covers designed for use with in-ground pools only. They usually come in a rectangular shape. Pool covers with a film of bubbles that capture solar energy and a transparent material that allows more solar energy to pass through. They are used to warm pool water and keep it warm. Specially made covers for spas and hot tubs. They keep away debris and prevent heat loss through evaporation. Here are some of the most popular pool cover brands in the market. 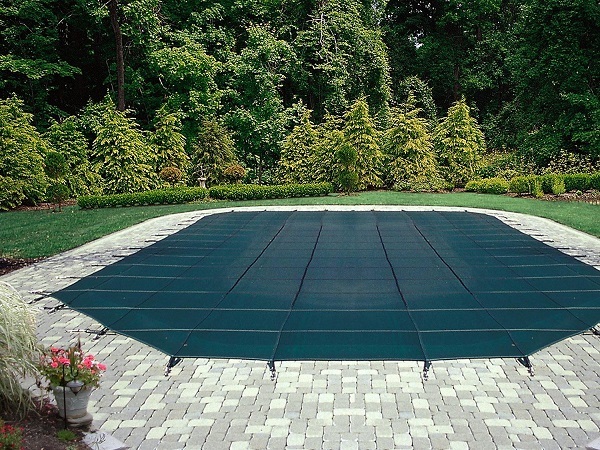 They sell a wide variety of pool covers from solar covers to automatic hydraulic pool covers. Click on a Manufacturer’s name to learn more about them. A California-based company that manufactures and sells a series of automatic pool covers. The covers incorporate minimal moving parts and an advanced dual-motor technology for longevity and ease of use. 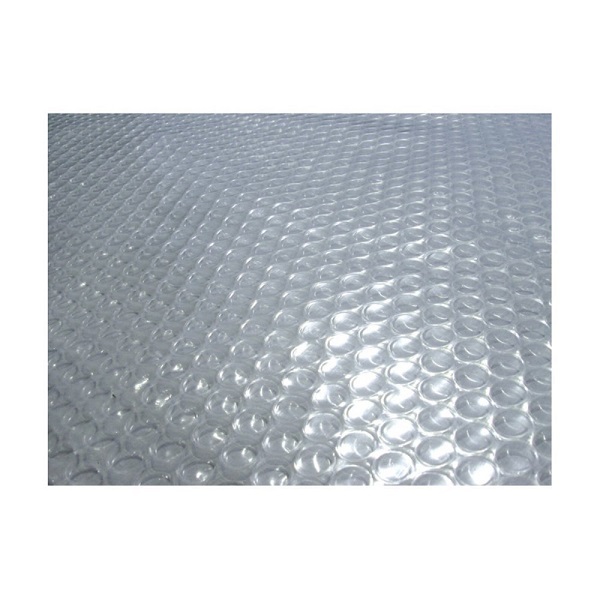 Arctic Armour manufacturers some safety mesh covers, both for residential and commercial pools. Bestway is a UK company that deals with pool accessories. They sell a variety of low-cost solar pool covers mostly for above ground pools. This sports and outdoors company is based in Illinois. In addition to other pool accessories, they sell a wide variety of pool covers including mesh covers, safety covers and winter pool blankets. Coverstar is a pool cover company based in Indianapolis, Indiana. They manufacturer automatic pool covers for residential and commercial swimming pools. Makers of the incredibly strong Loop-Loc Ultra-Loc II Solid Safety Pool Cover. They also sell several other safety covers, including one for commercial pools. You can also get a pool cover with your customized logo. An Ohio company specializing in various pool products including safety and solid pool covers. This West Chicago company deals with different types of pool products and accessories. The pool covers include winter blankets, solar covers, safety covers and spa covers. They also provide customized options for spa and safety covers. Intex is a maker of spas and above ground pools. So naturally, they sell covers for above ground pools as well as spas. Latham is a major pool products company based in New York. They sell both automatic and manual pool covers. For the manual types, they make the mesh and solid safety covers. Leslie’s sells a wide range of pool products and accessories including several types of pool covers. These include solar covers, safety covers and winter covers. Merlin Industries deals with safety covers and spa covers. Their SmartMesh safety cover can filter out debris as small as 40 microns while still letting rain through. Meyco deals mostly with custom safety pool and spa covers. Whether you have a rectangular, round, oval or freeform pool, they can help you. They manufacturer safety covers for both residential and commercial pools. Summer Waves sells clear solar covers for above ground pools of different sizes. Available on Walmart.com. Rayner Covering Systems sells pool and spa covers as well as cover repair services. They have three types of pool covers; safety mesh, vinyl and hybrid cover consisting of vinyl with mesh drain panel. Robelle makes and sells above ground and in-ground pool covers of various types. The covers are available in various sizes and colors. Interested in a Robotic Pool Cleaner For Your Pool? This website is the most popular robotic pool cleaner review site online. Read our buying guide and our in-depth reviews to learn about the best robot pool cleaners and how they compare.